The identity of the painter of ‘Bradda Head, Isle of Man’ has long been a mystery at Manx National Heritage, until March 2018, when all was revealed by Art Detectives from Art UK . 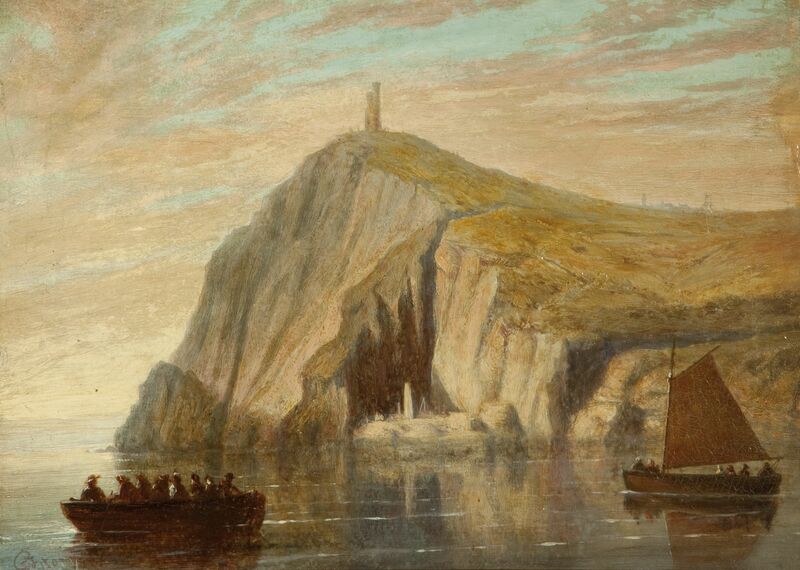 The painting shows in the foreground a number of people in an open boat (believed to be the Port St Mary lifeboat). On the top of Bradda Head is Milner’s Tower, which was built in 1871 and in the background the mine workings at the foot of the cliffs. The painting is an interesting record of Bradda Head’s industrial past – but who painted it, and when? An indistinct signature on the lower left side of the painting was the only clue – so Manx National Heritage put the question to Art Detectives from Art UK. A close inspection of the artist’s signature revealed that the painting was the work of John James Story (c.1828–1899). John James Story was born in Nottingham c.1828, where he lived for all of his life. His wife, Mary Ann, died at Havelock Street, Nottingham, on the 23rd November 1858, aged 28. He was best known by the name J. J. Story. He died in Nottingham and was buried there on the 11th September 1899. Story was most renowned for painting and promoting the “Grand Moving Panorama, Illustrating an Ocean and Overland Journey Around the World”. This famous diorama toured the length and breadth of the UK throughout the 1860s. During the 1870s he toured his “Second Tour Around The World”. He was also responsible for the create of other dioramas, including one in 1860 entitled ‘The Campaigns of Garibaldi’. The UK Census of 1871 lists him as a Scenic Artist, and the 1891 Census as a Landscape Artist. From 1880 onwards, Story also exhibited numerous individual paintings at exhibitions in Nottingham. These included ‘To The Land of the Hereafter’ (1881) and “Lighthouse, Douglas Head, Isle of Man” (1887), the latter, being reviewed in the Nottinghamshire Guardian of the 20th May 1887, as being ‘characterised by boldness and breadth’. Art Detectives discovered that a painting titled “Bradda Head, Isle of Man” was shown at Nottingham Castle in the seventh annual exhibition of pictures in oil and watercolour by Local Artists, May 1885 to August 1885, as listed in the “open” exhibitions: 222. “Bradda Head, Isle of Man” 3 gns. Given that Story was on the Isle of Man sometime before or during 1887 it is likely that, as well as painting the above-mentioned Douglas Head, he also took the time to paint Bradda Head. We are delighted to see this longstanding puzzle solved thanks to Art Detectives at Art UK.